The Greek sculptor Lysippus radically innovated the traditional iconography of the hero, here in the Farnese Hercules capturing him not at the moment of his irresistible triumph against the opponent of the day, but in an attitude of exhaustion and pensiveness. Wearied by the effort of shouldering the Earth, while Atlas seeks the three apples of the Hesperides he is holding behind his back, Hercules seems to be meditating on the destiny waiting for him at the end of his twelve labors, conscious of his strength and of his limits. This explains the great favor enjoyed by this version as a model for replicas in the Imperial period, when the new Herculean ideal of Stoic matrix took hold, with the Peloponnesian hero embodying the moral fortitude of the wise man in the face of adversities. Lysippus’s type of sculpture, called Farnese because one of the best replicas belonged to that famed collection, from the end of the II Century A.D. was even used as a support for the busts of emperors, desirous of presenting themselves to their subjects as philanthropic rulers prostrated by the weight of command, exercised for the wellbeing of mankind. 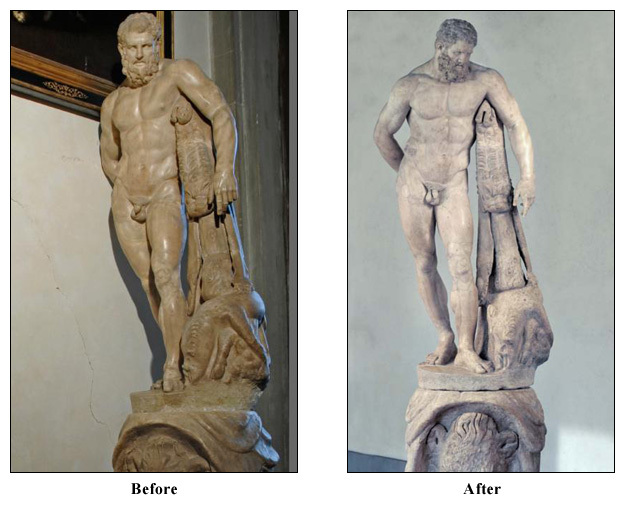 This is not the case though of the Florentine statue, until 1787 at Villa Medici in Rome, that has neither the extremely tumid muscularity nor the gigantic size of some of the copies of Antonine Age. On the whole, the Uffizi replica seems to represent the leanness that characterized the lost bronze IV-Century-BC archetype, with a pensive face transpiring the spiritual weariness of the melancholic hero imagined by Lysippus. The cleaning has been gradual and differentiated in consideration of the composite nature of the sculpture and of the different chromatic alterations due to the coherent deposits on the surface. The initial phase, carried out with cotton swabs moistened with deionized water and turpentine essence, revealed numerous putty repairs of preceding interventions. These had largely lost their bond and changed the color and it was necessary to mechanically remove them using a scalpel. After carrying out a detailed mapping of fractures and tassels, new putties were applied using a mortar based on marble dust and natural pigments. Finally, where the existing patina did not ensure adequate protection, a micro-crystalline coat was applied.